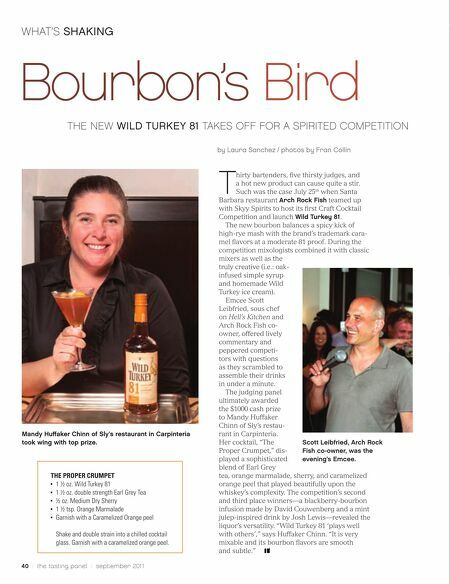 WHAT'S SHAKING Bourbon's Bird T hirty bartenders, five thirsty judges, and a hot new product can cause quite a stir. Such was the case July 25th when Santa Barbara restaurant Arch Rock Fish teamed up with Skyy Spirits to host its first Craft Cocktail Competition and launch Wild Turkey 81. The new bourbon balances a spicy kick of high-rye mash with the brand's trademark cara- mel flavors at a moderate 81 proof. During the competition mixologists combined it with classic mixers as well as the truly creative (i.e. : oak- infused simple syrup and homemade Wild Turkey ice cream). Emcee Scott Mandy Huffaker Chinn of Sly's restaurant in Carpinteria took wing with top prize. Leibfried, sous chef on Hell's Kitchen and Arch Rock Fish co- owner, offered lively commentary and peppered competi- tors with questions as they scrambled to assemble their drinks in under a minute. The judging panel ultimately awarded the $1000 cash prize to Mandy Huffaker Chinn of Sly's restau- rant in Carpinteria. Her cocktail, "The Proper Crumpet," dis- played a sophisticated blend of Earl Grey THE PROPER CRUMPET 1 ½ oz. Wild Turkey 81 ■ ■ ■ ■ ■ 1 ½ oz. double strength Earl Grey Tea ½ oz. Medium Dry Sherry 1 ½ tsp. Orange Marmalade Garnish with a Caramelized Orange peel Shake and double strain into a chilled cocktail glass. Garnish with a caramelized orange peel. 40 / the tasting panel / september 201 1 THE NEW WILD TURKEY 81 TAKES OFF FOR A SPIRITED COMPETITION by Laura Sanchez / photos by Fran Collin Scott Leibfried, Arch Rock Fish co-owner, was the evening's Emcee. tea, orange marmalade, sherry, and caramelized orange peel that played beautifully upon the whiskey's complexity. The competition's second and third place winners—a blackberry-bourbon infusion made by David Couwenberg and a mint julep-inspired drink by Josh Lewis—revealed the liquor's versatility. "Wild Turkey 81 'plays well with others'," says Huffaker Chinn. "It is very mixable and its bourbon flavors are smooth and subtle."